WANNA BE OUR SYDNEY VAMPS REVIEWER? Good news! We’ve been offered a double pass to head along to The Vamps’ show at Sydney’s Allphones Arena next Saturday night (January 23). HOORAY! Bad news! Sadly, we’ll be unable to attend. BOOOO!!! Good news! So, thanks to the lovelies at Frontier Touring, we’ve decided to throw it open to you! MUCH WOOTING ENSUES. Love The Vamps? 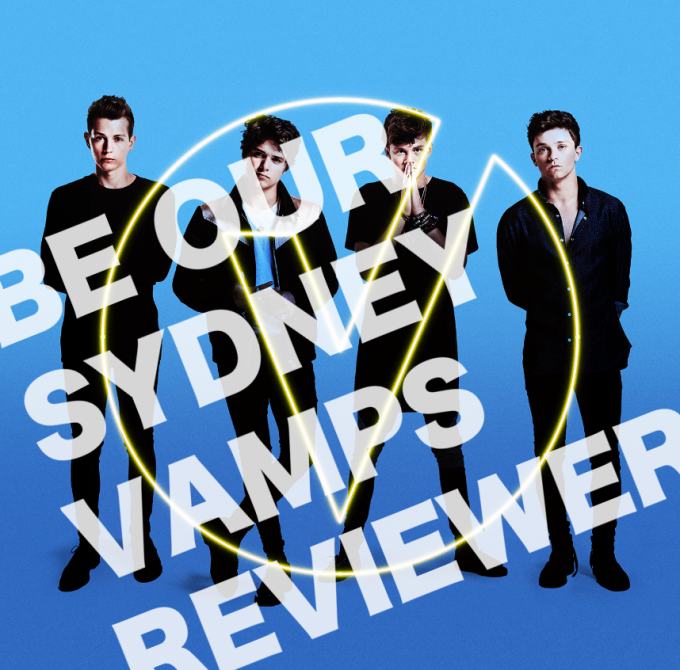 Do you think you have what it takes to be our reviewer for The Vamps’ show in Sydney? All we’d need from you is a couple of hundred words about the experience in return for a double pass to go and see the show. And it’s not just The Vamps. You’ve also got Tyde Levi, Little Sea, At Sunset and The Tide playing the support roles. Head to our CONTACT page and tell us in 25 words or less why you’d be our perfect pick to send along to the show! Please include your contact details (including telephone number) so we can get in contact with you should you be “the chosen one”. Who knows, it might be the start of a beautiful relationship where we get to send you to even more shows in the future! But hurry… we’ll close off entries at 8pm AEDT on Tuesday January 19. * Tickets only; transport to and from the venue, accommodation, refreshments, programme etc are the responsibility of the winner.